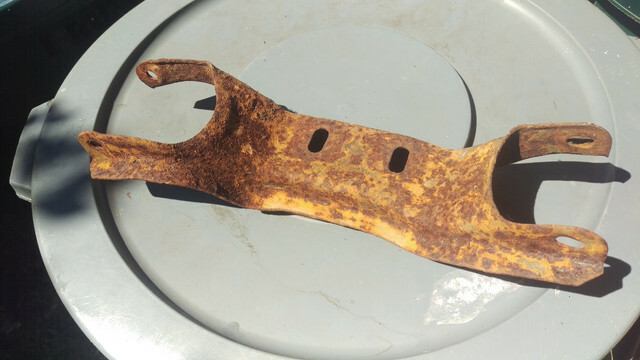 I have been trying to find out what the C4 transmission crossmember looks like for the 71-73s as the old one didn't come in the parts with my car when I imported it, and internet searches on the parts sites doesn't show a c4 crossmember for a 71-73 just one for a 66-70 like in this CJ pony parts listing link below. However a couple of old threads 2015 came up on a google search about the same issue where a 3 arm crossmember was on a c4 and pushing it sideways but some members had posted photos of their old crossmembers they could send the thread poster and they looked identical to the one pictured on CJ's for the c4 for 66-70 models so am a bit confused. Here's an eBay listing for the C-4 compatible crossmember, it'll also work on 3& 4 speed trans. AFAIK, the one with the welding in reinforcement plate was used on manual trans cars. My 73 has a C-4 behind 351 PO took FMX out so I would have to go look see but I also thought that 3 or 4 speed was the same. (07-07-2018, 06:32 AM)Hemikiller Wrote: Here's an eBay listing for the C-4 compatible crossmember, it'll also work on 3& 4 speed trans. Thanks. The one on Ebay I see is sold but it does look exactly the same as the one CJ Pony parts sell but say for 66-70 so hence my confusion. Looks the same, but doesn't mean it's dimensionally the same. Here one that I personally took out of a 71 car with a C-4. (07-07-2018, 09:24 AM)Hemikiller Wrote: Looks the same, but doesn't mean it's dimensionally the same. Here one that I personally took out of a 71 car with a C-4. Mmm thanks. Does look identical that's why I can't understand why they have them new up to 70 models but not 71-73?? Here is a pic of my C 4 with the bracket installed. (07-08-2018, 04:26 AM)NOT A T5 Wrote: Here is a pic of my C 4 with the bracket installed. I just read the fine print on the C4 transmission crossmember for the 66-70 models which looks similar to the 73 crossmembers photos posted, but it says that bracket will not fit a 351 or big block so now am even more confused at what I need to find for my 73 with a 351W and the C4.